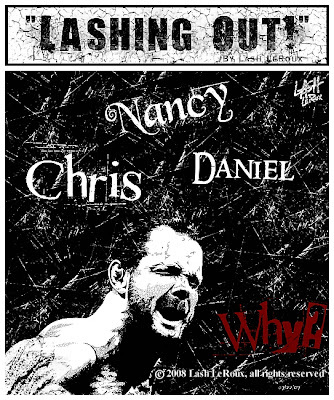 This is a tribute I created for THE WRESTLER/INSIDE WRESTLING after the death of Chris Benoit. Despite the horrific facts surrounding the case, it is impossible for me to remember Chris as anything other than the warm hearted family man, friend and mentor that I personally knew him to be. As a result, I decided to depict him in a manner that I felt wasn't overly positive or negative, but allows everyone to draw their own conclusions. Hence, my inclusion of the names of the family members and the question that I think was on every fans' mind, "Why?". That was a very sad moment...But for your talent of drawing and expressing the pain in the picture is fantastic. You have always been soooo talented with your illustrations. I remember when we were at WCW and u designed my Bombs Away logos on my first beaters. And I still have them. LOL!!! :-) Keep up with your art...I love it! !